Last week I told you how to add a tabbed e-mail view to Microsoft Outlook. Cool, right? Of course, that probably left you salivating for tabs in other areas of Office, namely Word, Excel, and PowerPoint. How about some tab love for those popular apps? 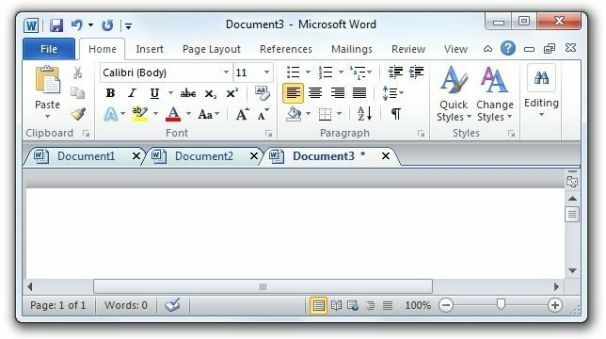 You got it: Office Tabs adds document tabs to Word, Excel, and PowerPoint. It's free, and it's awesome. With Office Tabs you can manage multiple documents in the same window, just like nature intended. In fact, this surprisingly versatile add-on gives you plenty of control over how tabs are managed, what color and font style they should have, and so on. Thankfully, these aren't universal controls: You can apply different settings across the three programs, and even disable it for one or two of them if you want. Other than that, your newly "tabbed" Office works just like the Office you know and love--but with tabs. And did I mention it's awesome?